Via BeSpecific post, check out the new BETA of standalone version of Zotero, the open source reference manager. Zotero is an easy-to-use yet powerful research tool that helps you gather, organize, and analyze sources (citations, full texts, web pages, images, and other objects), and lets you share the results of your research in a variety of ways. 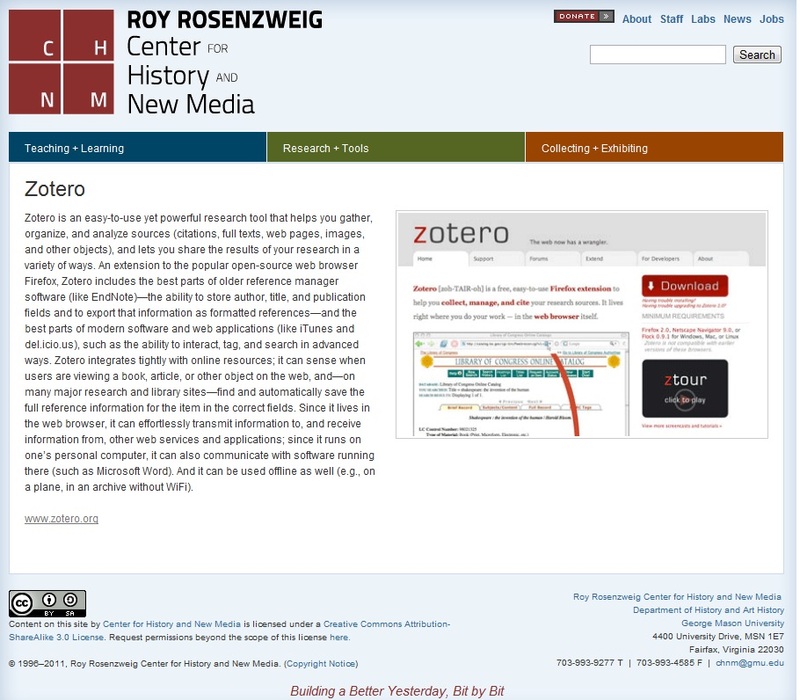 An extension to the popular open-source web browser Firefox, Zotero includes the best parts of older reference manager software (like EndNote)—the ability to store author, title, and publication fields and to export that information as formatted references—and the best parts of modern software and web applications (like iTunes and del.icio.us), such as the ability to interact, tag, and search in advanced ways. Zotero integrates tightly with online resources; it can sense when users are viewing a book, article, or other object on the web, and—on many major research and library sites—find and automatically save the full reference information for the item in the correct fields. Since it lives in the web browser, it can effortlessly transmit information to, and receive information from, other web services and applications; since it runs on one’s personal computer, it can also communicate with software running there (such as Microsoft Word). And it can be used offline as well (e.g., on a plane, in an archive without WiFi). Next Library Scavenger Hunt Winners!